Cawfields Quarry is well-signposted on the B6318 (the Military Road) travelling from both the east and west (the turning is opposite the Milecastle Inn). This is another of the Northumberland National Park car parks for which a season ticket can be acquired; an ordinary ticket bought from the machine here can be used on that day at any of the other National Park car parks along the Wall. Always be aware of the possibility of thieves operating in the car park. Follow signs for the Hadrian’s Wall Path to access sites to either side of Cawfields Quarry. Stout footwear is advisable. Great Chesters is unusual in that it is largely unconsolidated and remains an atmospheric ruin, rather than a manicured monument. Here too we can see how a fort has become a later farming settlement. Covering 1.35ha (3.36 acres), this fort is (rather unusually) aligned east to west and lies 9.7km (6 miles) from its neighbour, Housesteads. It was added to the Wall some time after AD 128 and was the base for the cohortes VI Nerviorum and VI Raetorum respectively during the 2nd century, and cohors II Asturum and the Raeti Gaesati during the 3rd. The Notitia records the cohors I Asturum as being here later. Inside the fort, surrounded by a wooden railing, there is part of the vaulted strong room of the headquarters building. From here we can look down towards the remains of the barrack buildings in the south-west quadrant of the fort, barely visible on the ground but very clear from the air. To the south can be seen the southern gateway, where there is a Roman altar which usually holds a few modern coins left on top in its focus by bemused visitors. 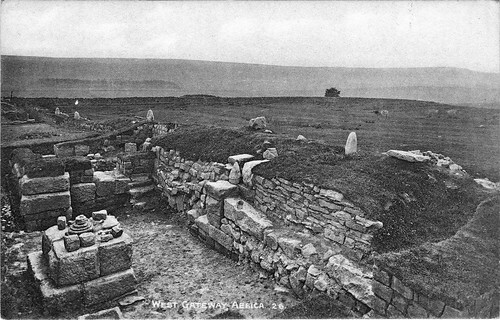 The west gateway demonstrates the use of blocking walls (which, as we now know, were usually removed by later excavators at other forts), with first one then both portals ultimately being blocked. The trail leads us across the site to a breach in the wall near the north-west corner, where we see the inner face of the appropriate corner tower. Leaving the fort, we may note the ruinous curtain wall to our right and the quadruple ditches to the left. Quadruple?! Time must have passed slowly at Aesica and a little ditch-digging can help keep you warm. There is no obvious tactical reason why only the western side of the fort should have been ‘hardened’ in this way. We continue westwards over a couple of stiles towards Cockmount Hill house, passing a solitary tree that marks the location of Turret 43a (more humps and bumps just east of the tree). The ruinous curtain wall has given way to a modern field wall. After the house, we enter the softwood plantation and emerge on the other side, and are rewarded with a treat. It is as well to pause and look at the gateway through the modern wall immediately to our north. 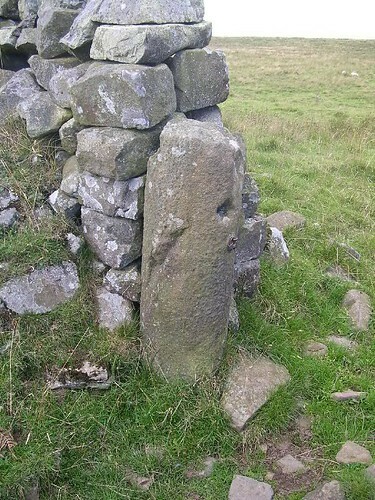 The western gatepost is an uninscribed milestone, probably taken from the Military Way, which runs only some 70m to the south of it. Roman milestones usually bore a carved inscription providing a date when built or repaired and sometimes a distance to the nearest significant point. However, there is now a strong suspicion that those that do not seem to bear such a carved inscription may instead have had a painted one (examples of these are known from Roman roads in the East). This not only means ‘uninscribed’ milestones may have been painted, but that ones bearing carved inscriptions (most such inscriptions are 3rd century AD or later in Britain) may also originally have been painted. Leaving the milestone, we carry on westwards, with the field wall on top of the curtain wall to our right and the ditch keeping pace beyond it. We are gradually climbing as we go, for there are more crags ahead. 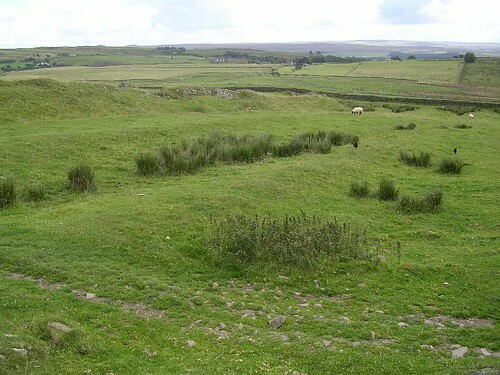 This long-axis milecastle is visible as an earthwork. It has evidently been excavated at some point but when, by whom, and what was found remain a mystery. Excavation is sometimes euphemistically referred to as ‘preservation by record’, but without a record, there is no ‘preservation’. 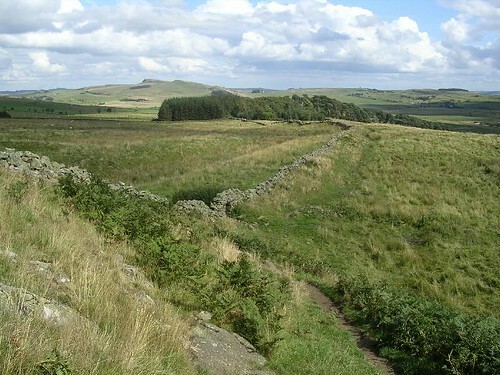 After Milecastle 44, the Wall turns to the south-east and begins to descend gently towards the plantation at Cockmount Hill. 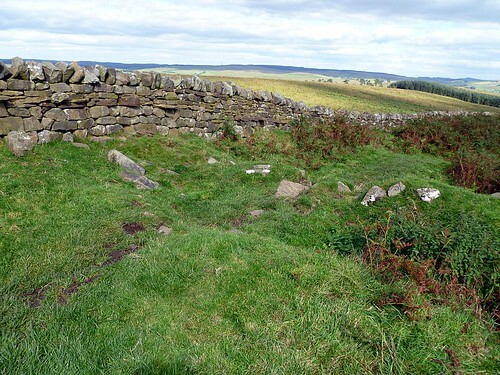 The line of the stone wall itself is represented by a drystone wall, but if we glance over it occasionally we will see that the ditch returns as the crags diminish and cease to offer any defence to the north. When we reach the wall surrounding the plantation, it is as well to pause and look at the gateway through the modern wall immediately to our north. The western gatepost is an uninscribed milestone, probably taken from the Military Way, which runs only some 70m to the south of it. Roman milestones usually bore a carved inscription providing a date when built or repaired and sometimes a distance to the nearest significant point. We also suspect that those that do not seem to bear such an inscription may instead have had a painted one (examples of these are known from Roman roads in the East). We enter the softwood plantation and emerge on the other side, passing Cockmount Hill house and press on, making best use of this more level terrain. A solitary tree then marks the location of Turret 43a (more humps and bumps just east of the tree) and we carry on over a couple of stiles and suddenly there is no longer a modern wall on top of the Roman one, just the ruinous curtain itself. 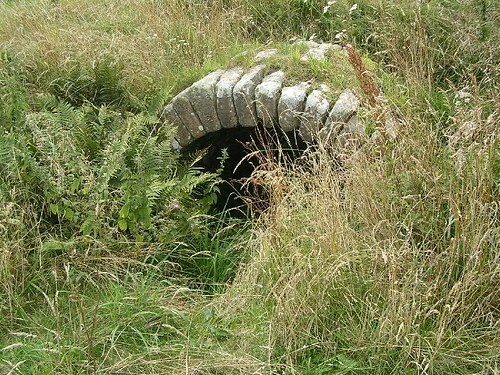 Finally we reach the field containing the western ditches of Great Chesters fort. Great Chesters is unusual in that it is largely unconsolidated and remains an atmospheric ruin, rather than a manicured monument. Covering 1.35ha (3.36 acres), this fort is (rather unusually) aligned east to west. It was added to the Wall some time after AD 128 and was the base for the cohortes VI Nerviorum and VI Raetorum respectively during the 2nd century, and cohors II Asturum and the Raeti Gaesati during the 3rd. The Notitia records the cohors I Asturum as being here later. After the unusually strong series of four ditches on the west of the fort, presumably the whim of an officer with nothing better to do, since the land to the east and south is not similarly provisioned. The trail takes us to the north-west corner, where we see the inner face of the appropriate corner tower. Once more we note how a fort has become a later farming settlement. Inside the fort, surrounded by a wooden railing, there is part of the vaulted strong room of the headquarters building. From here we can look down towards the remains of the barrack buildings in the south-west quadrant of the fort, barely visible on the ground but very clear from the air. To the south can be seen the southern gateway, where there is a Roman altar which usually holds a few modern coins left on top in its focus by bemused visitors. 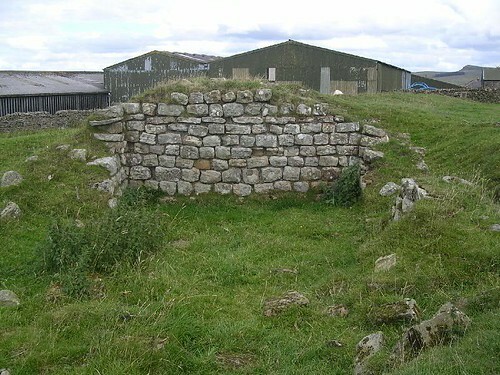 The west gateway demonstrates the use of blocking walls (which, as we now know, were usually removed by later excavators at other forts), with first one then both portals ultimately being blocked. Great Chesters is also remarkable for its aqueduct, the course of which is known for most of its length of 9.5km (from a source just over 4km away). It has been traced as an open channel, rather than an elevated structure. Sadly, there is nothing to see at the fort to mark its arrival. 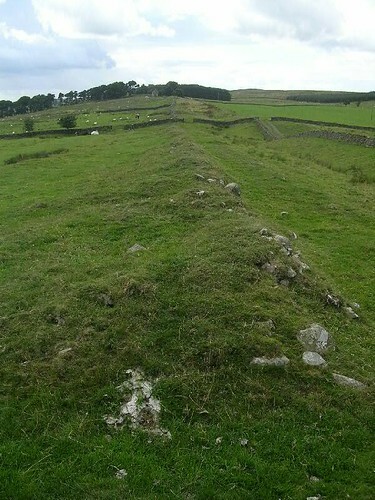 Most forts probably had aqueducts (Housesteads is an exception to this rule, as we shall see) but very few have been studied. 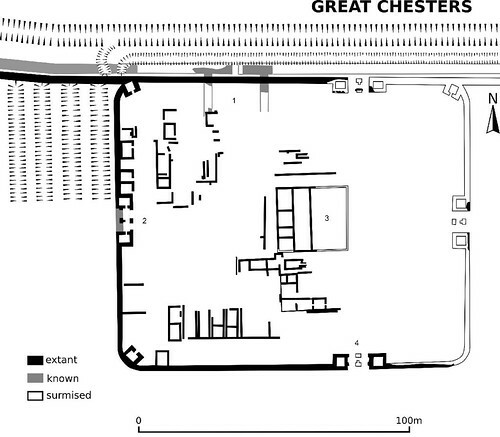 Excavation at Great Chesters in 1939 showed that the fort had been constructed on top of the short-axis Milecastle 43 (Great Chesters), which was razed to the ground, and there is now nothing to see.